Westside Barbell is the strongest gym in the world. A quick review of their gym stats will tell you all you need to know; these men and women have the art of strength down to a science and are quite simply the best at what they do. Having been fortunate enough to train with and become certified under Louie, I’ve experienced Westside’s system first-hand and truly want to provide everything I’ve learned in the simplest and most accessible form possible. Through writing numerous articles covering Westside Barbell and their methods I hope each and every individual can learn from and incorporate this information into their training in order to reach their ultimate goals in a safe and effective manner. Many people seem to mistakenly equate an “effective” method with an “easy” method. In the hope of satisfying their desire for the ultimate quick-fix they assume the best system must be the easiest system. Do not fall into this trap. It is an awful train of thought and will eventually lead you to failure. The Westside Barbell Conjugate System is one of the most efficient and effective methods you can employ in order to achieve your true potential in all things pertaining to strength. That being said, do not expect the training to be effortless, easy, or pain free. Those who make this mistake are in for quite the rude awakening. If you’re willing, ready, and have the desire to put in the time, effort, and dedication to do what is necessary to realize your objectives then you’ve come to the right place. If not…perhaps this website would be more to your liking. Enough fluff-talk; it’s time to Build the Bench Press – Westside Barbell Style. Once my ears have stopped bleeding profusely I’ll ask them numerous questions regarding their current routine, only to find out that they don’t have one and rarely, if ever, lift heavy. Now that’s what I call a recipe for success! After working up to a 1-3RM, train your triceps, back, shoulders, and abs. Finish your workout within 60-70 minutes. After using this method, wait 72 hours before training the same major muscle groups again. Above I told you that in order to bench big weights you need to lift heavy. Well, now I’m going to go completely against what I just advised and tell you to devote a separate training session to using weights of roughly 50% 1RM. Basically, through properly incorporating the Dynamic Effort Method, one can drastically improve their rate of force development (RFD) and explosive strength, avoid the formation of a speed barrier and suffering the Law of Accommodation, and sufficiently recover from a maximal effort workout. You should have noticed that under the Maximal Effort Method and the Dynamic Effort Method I specifically advised training the triceps, back, shoulders, and abs. This “accessory work” is of the utmost importance when training to improve one’s bench press and is the perfect time to make use of the Repetition Method. The Repetition Method can be used for improving “size, strength-endurance, and restoration.” (Simmons) At Westside, lifters are constantly training to improve their work-capacity and break records, even in the non-classical lifts. Through consistently developing and progressing in their accessory work they ensure their continued success as the strongest lifters in the world. Train your weaknesses! If you need to gain size, use higher repetitions; if your rear-delts are weak, train them hard! No trainees are the same and therefore should not be training exactly the same way. Constantly aim to improve. Whether it’s with more weight, more time under tension (TUT), a greater range of motion (ROM), more repetitions, or a separate means of progression is irrelevant. If you want to get stronger you need to improve in everything! Don’t be afraid of training to failure! Many people in this industry depict training to failure as a horrible and unproductive method. Interestingly, the best benchers in the world do it at least four times per week. Hmmm…. Make use of movements such as: dumbbell presses, tricep extensions, dips, rows, lat pull downs, chins, shoulder raises (front, lateral, rear), ab roll outs, leg raises, standing crunches, and any other exercises which target the major muscle groups used in the bench press. The myth that a big bench press is the product of bigger and stronger pecs is one of the most ignorant and ill-advised recommendations within this industry. If anyone ever tells you the key to a bigger bench press is to train your pecs, I strongly encourage you to remove yourself from the situation as quickly as possible. Question: If your pecs aren’t the key to a big bench press, what is? Answer: Strong triceps (specifically around the elbow), mid/upper back and lats, shoulders, and abs. You need a strong lower-body too, but that’s a topic for another day. Triceps: Dips, Skull Crushers (elbows out and bar to the neck), all forms of tricep extensions (band, cable, dumbbell, barbell, etc. ), pushups. Shoulders: All variations of front, lateral, and side raises (band, cable, dumbbell, plate, etc), overhead press variations. Abs: Leg Raises, Wheel Rollouts, Standing Cable Crunches, Decline Sit-Ups, Standing Oblique Crunches. Lesson: Train your triceps, back, shoulders, and abs hard after the main move of every [bench] day. All too often I see people flopped onto the bench, back totally loose, shoulder blades on either side of the bench, and shoulders rotating forward every time they push the barbell back up. What does this mean? Well, if you continue benching like this (i.e. like most people) you will never come close to your true potential and you will almost certainly end up with a serious injury. This is how we fix it: Sitting in your chair right now I want you to put your arms out in front of you as though you were about to bench press. Now, with your arms straight and your chest tall I want you to shove your shoulders down and away from your ears. Once you’ve done that try squeezing your upper back together as tight as possible. 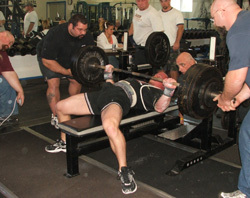 However, I have found that not only do individuals immediately bench press more weight, but their form and technique drastically improves upon trying to visualize pushing themselves away from the bar and into the bench. This is perhaps the most obvious error made by the majority of trainees while benching, but most don’t realize it until it has specifically been brought to their attention. The next time you’re in the gym I want you to analyze everyone’s bench press and take note of where the bar is in relation to their wrists and elbows. I guarantee you’ll inevitably see the majority of people trying to bench with the bar travelling towards their face, their wrists bent, and their elbows somewhat pointing to the wall in front of them. In essence it will resemble a pseudo tricep extension. Needless to say, this is an obvious mechanical disadvantage. So how do we fix this? 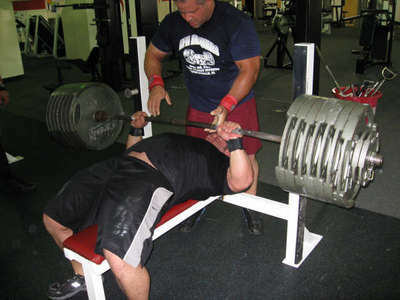 Another name I use for National Bench Press Day (i.e. Monday in every gym across America) is Happy Feet Day. For some reason, most people who don’t know how to bench press properly will either perform some sort of “happy feet” dance or put their feet on top of the bench during the movement. I beg you…please do not do this. One of the most crucial components of a strong bench is learning how to stay tight. But how can you stay tight if your feet are performing their own personal rendition of the Cha Cha Slide? 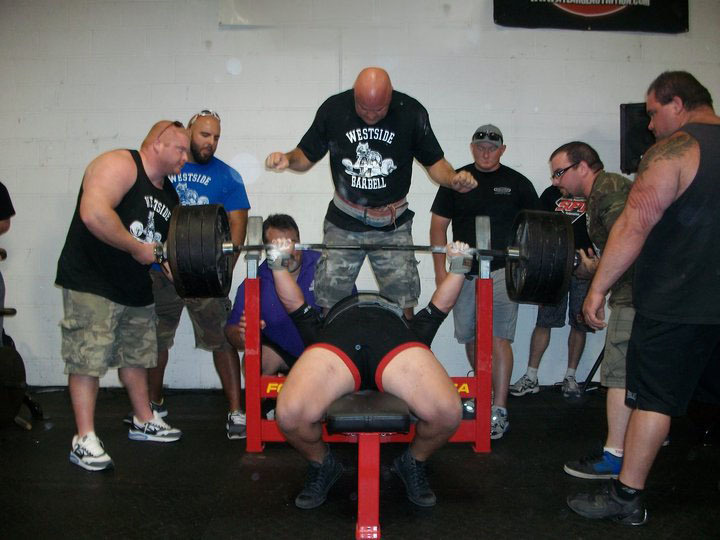 There are many ways to set up your feet during the bench press. Where you decide to place your feet is highly individual and ultimately depends on what works best for you. Lesson: Drive through your heels and stay as tight as possible throughout the entire movement. It’s no coincidence that Westside Barbell is home to the strongest men and women in the world. Despite being an absolute genius and creating The Westside Barbell Conjugate Method, perhaps Louie’s most incredible trait is that he will never be satisfied with his current level of knowledge and will always be searching for a better and more efficient way to train. While I hope you learned a lot in this article and will be able to see a positive change in your bench press, I sincerely want to stress the importance of considering yourself a life-long student.